By adding a rowing workout to your fitness routine you will burn up to 50 percent more calories while strengthening nearly all the muscles from your shoulders to your calves. Rowing is a full body exercise, is low impact and can really increase your endurance. A rowing workout roughly comprises 60% legs, 20% core, and 10% arms and shoulders — So a rowing machine is a good option to change up your training because it provides an equivalent cardio workout to a treadmill while also building your core and is impact free. Rowing requires equal effort from your upper and lower body, cardio fitness, and endurance to workout rep after rep. And it's great for fat loss, too. You will burn an equivalent number of calories to jogging a 12 minute mile. A rowing machine benefits the abs by constantly engaging the core throughout every rowing stroke and is a full-body fat burning movement. Rowing is a great option to build stronger abdominal muscles. Rowing will help tone the muscles in your back and train your leg muscles; the glutes, hamstrings and quads, plus provides a powerful workout for your upper body. When you pull your body back, your shoulders, arms and back have to work. The continuous rowing motion uses your full entire body so it boosts your heart rate giving you an aerobic power workout as well increasing your strength and endurance. This entire process should be a smooth, fluid continuous movement. A good target stroke rate (measured as “strokes per minute” or SPM) for most workouts will be in the range of 22–26 SPM. With practice you can improve on this and add intensity at which you row. It helps to have a mirror so you can watch and adjust your form. 1. Start in the “Catch” Position, the beginning part of the rowing stroke, with your knees bent at a 90° angle, head up, back angled forward and tall with your arms extended out completely forward and check the chain is parallel with the rower, when holding the handle. 2. The power phase of the stroke is called the Drive. Push quickly through with your legs, then begin to hinge your body back slightly. Once your torso is leaning back at about a 45°s and your legs are almost fully extended, pull the handle flat through to your chest or abs, keeping your elbows lifted. 3. 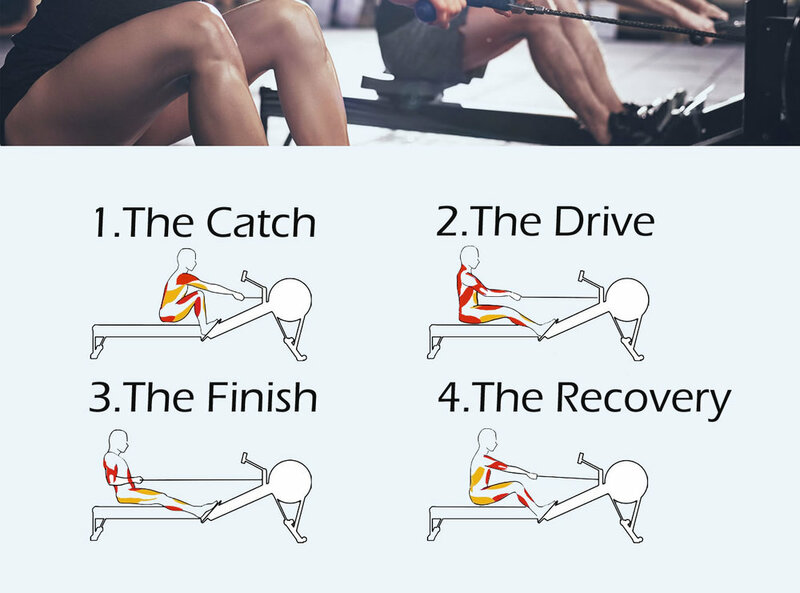 The final part of the rowing stroke is the “Return or Finish” phase. Your back should be straight-up leaning back at roughly a 100° angle, head up and elbows just past your body with the handle held just under your chest. 4. The Recovery. Release your arms by straightening them; then, your torso follows. Finally, your knees bend and take you slide gently back to the “Catch” position. TIP: BE STRONG & QUICK IN THE DRIVE & SMOOTH & RELAXED ON THE RECOVERY. One of the best ways to improve is to spend two or three minutes practicing the correct sequence and form at the start of each session to perfect your stroke technique – plus you get good warm up. The “Split” refers to how much time it would take you to cover 500 meters. It is your 500-meter pace commonly referred your “Split time,” So for example, if you are holding a 1:45 split, then it will take you 1 minute, 45 seconds to cover 500 meters. Getting started? Split times around 2 minutes/500 meters is a good start. You can take your split time and convert it to a Watts power number, a 2 minute/500 meters equals 200 Watts. You should aim to keep your 500-meter pace consistent throughout your row. A good target stroke rate (measured as “strokes per minute” or SPM) for most workouts will be in the range of 22–26 SPM. Practice holding a specific SPM for an extended period of time. At first it will be rough, but as with any training if you persist you will improve. You will start to know what a 24 SPM feels like. Watts refers to the amount of power you expend in a single stroke. The higher your watts go, the more powerful your strokes are. Generally, higher wattage comes with lower split times. If you’re exerting more power through the drive, you’re theoretically pushing the boat forward faster. The simplest way to increase your watts is to keep your technique correct. This takes a little time and practice, so don’t worry if you’re not getting it right the first few tries. Indoor Rowing is a great work out because is a full-body exercise that can help build and tone muscles, improve cardiovascular function and increase stamina. Rowing is also low-impact being very easy on joints and burns loads of calories. If you dislike running and are not a bike fan but need a well balanced exercise program to stay in shape or loose some weight you won't be sorry with the results from rowing once you master the stroke technique. NordicTrack RW500 - New for this rower's design allows it to fold for easy storage and space savings when you are not working out. 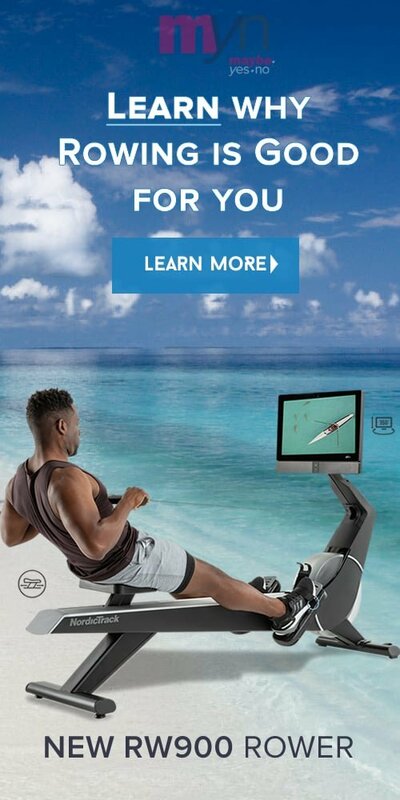 The RW500 has classes created specifically for an all-body workout by rowing with a trainer, or you can select gorgeous scenic rivers to row on. So Cool! THE RW500 comes with a touchscreen 10” tablet that integrates with iFit Coach training classes while at the same time syncs with your your strokes to display power stats plus captures workout data to track your progress. *RPE stands for “Rated Perceived Exertion” and essentially is a numerical way to rate how difficult the exercise feels while you perform it. 1 being easy and 10 being all out.